For my birthday at the beginning of this month, I received many wonderful birthday greetings via email, Facebook, and as e-cards. A few days afterward, I opened my mailbox to find an envelope containing a card that my dear longtime friend Irene had sent me via regular post. Inside the card, along with aromatic dried rose petals, was a long letter. Unfolding it made me smile. Before emails became so prominent, she and I often mailed each other letters, and receiving this was like receiving a special gift. Like most people, I have succumbed to sending emails as my major method of communication. I’ve been known to type letter-long emails to friends and family. I feel a certain satisfaction about the immediacy with which they receive my missive, and there’s an expectation that their replies will also be expedient. Even though I’m not THAT old, I still remember the days before email and low cost long-distance phoning, and I was an avid correspondent to friends and family who lived some distance away. The beauty of that practice is that I have kept many of those letters, and thus have a documented record of who we were at that time in our lives. Now with emails that get deleted when they’ve been read, whole transcripts of interactions are lost. I love to hold sheets of paper that someone has filled with words about things that matter to them and to me, and it wasn’t until I read Irene’s wonderful letter that I realized how much I missed receiving letters in the mail. People express similar sentiments about e-books and print books. They claim that with e-books they miss the feel of a volume in their hands, the tactile process of turning pages, the smell of the print on the page. Personally, as a matter of convenience, I read more books on my iPad than I do print books. From an aesthetic perspective, I love the sight of book-filled shelves with all those strikingly coloured spines, and I still love holding a book with a beautiful cover and flipping through pages to find a passage I want to reread. 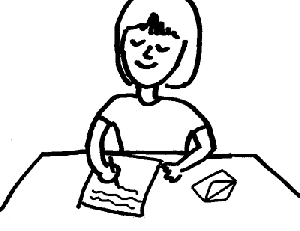 But what really matters to me is the message that the book, or letter or email for that matter, conveys. So while the tactile experience of reading a printed book or paper letter gives me pleasure, it is the reading of the words that truly feeds my soul. I still type long emails. I prefer to write my novels using a computer than with pen and a pad of paper. I will read a book in any format I acquire it. And I will reply to Irene’s letter by writing her an equally long one and sending it off in the mail. How about you? Do you prefer a screen or paper? Or does it matter? When I attended the Malice Domestic convention in April, I met an avid cozy mystery reader who had read the first Lucy Arlington book and was eager to meet the author(s). As Lynn and I spoke together, we realized that we enjoyed one another’s company very much. 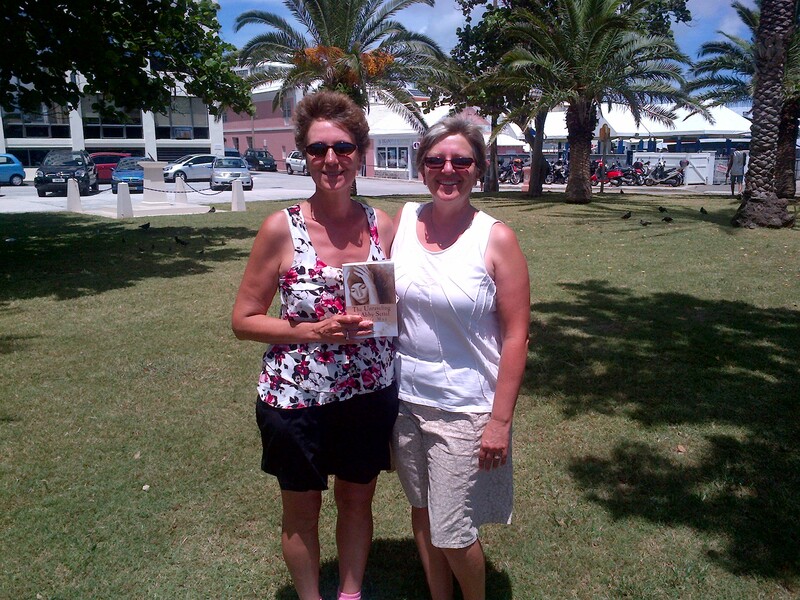 In the course of the conversation, Lynn was very interested to discover that I live in Bermuda because she has always wanted to visit the island. A few months later, she sent me an email to tell me that she and her family had booked a holiday to Bermuda in July, and would it be possible to meet up again. She added a postscript to the note, that she’d purchased The Unraveling of Abby Settel and was looking forward to reading it on her trip. We arranged to get together in a park by the harbour in Hamilton, and it was fun to meet her husband and other members of her family. They had a multitude of questions about what it was like to live on this beautiful island, recommendations for a good place to have dinner, what they absolutely shouldn’t miss seeing. And then Lynn told me that she had finished reading my book, how it had touched her, and how she related to much of Abby’s life even though she herself had never had to go through a relocation. Of course I signed her copy. All in all, we spent a pleasant hour together in the shade of a tree, talking about books, writing, and life. I was smiling as I walked back to my scooter, thinking about how the stars had aligned for us to have a chance to see each other again. And how not only was she a fan of Lucy Arlington’s books, but now also of Sylvia May’s. Even better, I had a new friend.